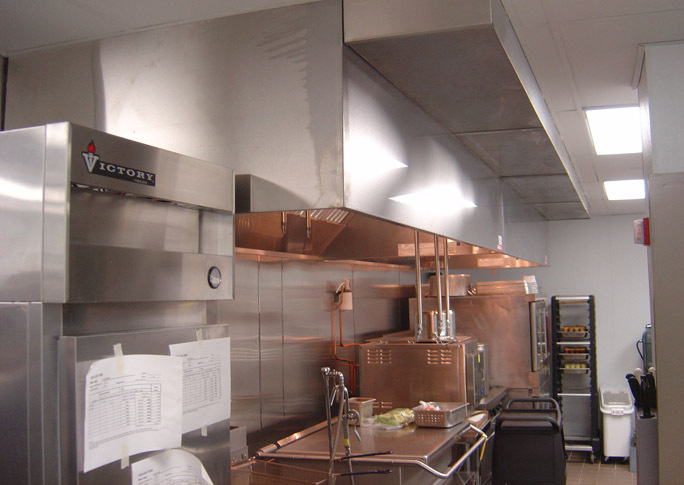 Commercial Kitchens and Exhaust Hoods are our specialty. We provide Design, Sales, Installation and 24/7 emergency service. We can design your kitchen for the most efficient and cost effective way to minimize unnecessary expenses. We provide Fabrication and Installation of Stainless steel, Exhaust hoods and Fire Suppression with the proper Ventilation to keep you running efficiently. We take the time to install all that is a part of your kitchen including Gas piping and the Commercial Food Equipment to go with it. For manufacturers such as Captive Aire, Larkin, Greenheck, Accurex or others we have installed them all with quality workmanship which we stand behind 100%. The last thing you need when running a business is equipment that don’t work or a kitchen that was improperly designed. We guarantee our work to be right the first time without any hidden costs. If you want the nicest looking kitchen with quality equipment and competitive rates then you have stopped at the right place. We proudly serve the St. Louis Metro areas, St. Charles, and Jefferson County including Central Missouri and Southern Illinois with the highest expectations of our industry. We always provide the Quality of our workmanship everyday as we continue to build long term relationships. For a free estimate give us a call. You’ll be glad you did.